CLICK Music’s April concert by ukulele master Stuart Fuchs is the culmination of a day-long collaboration between CLICK Workspace and Downtown Sounds on Saturday, April 29th. 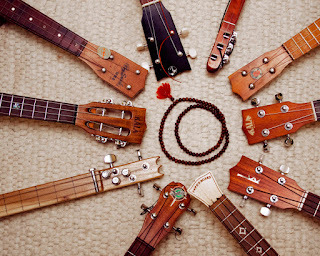 In the afternoon, ukulele students of all ages and skill levels will be led through workshops taught by Fuchs and arranged by Downtown Sounds owner Joe Blumenthal, who runs the local A.E.I.O.Ukes ukulele club. Then at 7:00 p.m., Fuchs will be joined by musician Sarah Carlisle for a performance of ukuleles, guitar, upright bass and mandolin, in which they will premiere new original songs from the upcoming album “After All the Time." Fuchs is a performing and teaching artist who has presented his innovative and holistic music workshops at the top ukulele festivals across the U.S. and Canada. In his concerts, he balances virtuosity and heart on his classical guitar, ukulele, Native American, flute and didjeridoo. He has arranged and performed the gypsy jazz guitar music of Django Reinhardt for full symphonic orchestras and was featured on PRI’s "The World” with his award winning gypsy jazz band, Babik. In 2014 Fuchs was awarded a grant from the National Endowment of the Arts for his work bringing healing music to cancer patients at Roswell Park Cancer Institute, where he was a professional artist in residence for over seven years. He is an endorsing artist with Kala Ukuleles and currently tours internationally with the world-renowned new age kirtan artist Snatam Kaur. CLICK Music draws crowds to its intimate performance space for up-close experiences with local artists who are given free reign to experiment with their music making. The series is curated by Northampton-based musician and producer Anand Nayak and sponsored in part by Downtown Sounds. Concerts are held at CLICK Workspace, 9 ½ Market Street, Northampton. Tickets to the Stuart Fuchs concert are available in advance for $12 via Eventbrite (service fees apply), and will be available at the door for $15 cash. Complete information and tickets are available at http://clickworkspace.org/events.